Sometime during the snowy winter of 1793, under cover of night, a small group of thieves pried open a wooden door leading into the Church of Saint-Roch. Forced entry into the Paris sanctuary was nearly a weekly occurrence during this time of revolution. In the early 1790s, anticlerical vandals had pulled enormous religious paintings off the walls and slashed the canvases. Other trespassers had made off with more portable works of art, including an exquisite statue sculpted by Étienne-Maurice Falconet. On this particular night, however, the intruders came to steal whatever copper, silver, or lead they could find in the crypt located underneath the Chapel of the Virgin. Setting to work in front of the chapel’s altar, the grave robbers used long iron bars to lever aside the mattress-sized marble slab in the center of the floor. Though they surely had no idea who was buried in the vault, the most loutish of the group, assuming he could read, would still have recognized the name of the writer Denis Diderot inscribed on one of the caskets. Dead for nine years, the notorious atheist had been the driving force behind the most controversial book project of the 18th century, the Encyclopédie. This massive dictionary had not only dragged sacrilege and freethinking out into the open, but triggered a decades-long scandal that involved the Sorbonne, the Paris Parlement, the Jesuits, the Jansenists, the king, and the pope. None of this old history mattered to the burglars. After removing Diderot’s lead coffin from the vault, the men simply shook his decomposing body onto the church’s marble floor. The following day, Denis Diderot’s remains (along with the other desecrated cadavers from the crypt) were presumably gathered up and transferred without ceremony to a mass grave about a mile to the east. Nobody noticed; nobody reported it in the press. Assuming the church’s few remaining parish priests had realized that Diderot had been buried in the church, they were undoubtedly relieved to be rid of the scandalous unbeliever. Diderot’s unedited books, essays, and criticism far surpassed what he had published during his lifetime. Diderot’s interest in speaking to future generations from beyond the grave had come about out of necessity. In 1749, shortly after the then 34-year-old writer had published a work of intemperate atheism entitled the Lettre sur les aveugles (Letter on the Blind), two gendarmes showed up at his house, arrested him, and dragged him off to Vincennes prison. Three months later, shortly before he was released, the lieutenant-général de police made a special trip to the prison to warn the writer that any further immoral or irreligious publications would bring about a jail sentence measured in decades, not months. Diderot took this threat seriously. For the next 33 years, he avoided publishing the kind of inflammatory books that he had authored as a young man. Much of the energy that he might have devoted to such endeavors was redirected toward the all-consuming Encyclopédie. When he finally completed the last volume of illustrations, in 1772, the now-elderly writer was well aware that he was a celebrity throughout Europe and even in parts of North America, but he was not really considered a literary great. His fate, as he admitted quite openly, was perhaps to “survive” long after his reputation as an Encyclopedist had faded, growing ever older and vanishing without leaving a significant work behind. What Voltaire and virtually everybody else did not know was that Diderot had actually written an astonishing range of improbably modern books and essays for the drawer, as the French like to say. Holed up in his sixth-floor garret office on the rue Taranne for the last third of his life, Diderot produced this cache of writing with the hope that it might one day explode like a bomb. This moment was prepared for carefully. When the author reached his sixties—borrowed time during the 18th century—he hired copyists to produce three separate collections of manuscripts. The first and most complete set was entrusted to his daughter, Angélique, whom we know as Madame de Vandeul; a second, less complete group of writings was transferred to his designated literary heir and devotee, Jacques-André Naigeon. And six months after his death, 32 bound volumes of manuscripts along with Diderot’s entire library of 3,000 books traveled by ship to Catherine the Great in Saint Petersburg. What Voltaire and virtually everybody else did not know was that Diderot had actually written an astonishing range of improbably modern books. Diderot’s unedited books, essays, and criticism far surpassed what he had published during his lifetime. Among these writings were two very dissimilar, but equally brilliant novels. The first of these, La religieuse (The Nun), is a gripping pseudo-memoir of a nun who suffers unspeakably cruel abuse after she announces that she wants to leave her convent. The second, Jacques le fataliste, is an open-ended antinovel where Diderot used fiction to take up the problem of free will. But there were also thick notebooks of revolutionary art criticism, a godless science-fiction-like chronicle of the human race, a secret political treatise written for Catherine the Great, a humorous satire on the absurdity of Christian sexual mores set in Tahiti, as well as some of the most moving love letters in the history of French literature. To become familiar with the range of Diderot’s work is to be stupefied: among other things, the philosophe dreamed of natural selection before Darwin, the Oedipus complex before Freud, and genetic manipulation 200 years before Dolly the Sheep was engineered. These hidden works did not appear in the months after Diderot died; they trickled out over the course of decades. Several of his lost books were published during the waning years of the French Revolution; others appeared during the course of the Bourbon Restoration (1814–30), while still more of his writing emerged during the Second Empire (1852–70). Perhaps the most significant addition to Diderot’s corpus came in 1890 when a librarian discovered a complete manuscript version of Diderot’s masterpiece, Le neveu de Rameau (Rameau’s Nephew), in a bouquiniste’s stand on the banks of the Seine. In this riotous philosophical dialogue, the writer courageously gave life to an unforgettable antihero who extolled the virtues of evil and social parasitism while preaching the right to unbridled pleasure. To say that the arrival of these lost books had an effect on subsequent generations would be putting it mildly. Diderot’s effusive art criticism inspired Stendhal, Balzac, and Baudelaire. Émile Zola credited Diderot’s “vivisections” of society as the foundation of the naturalism that characterized his and Balzac’s novels. Social theorists, too, were spellbound by Diderot’s prescient thought. Karl Marx, who borrowed deeply from Diderot’s musings on class struggle, listed the writer as his favorite author. And Sigmund Freud credited the ancien régime thinker for recognizing the unconscious psychosexual desires of childhood in Rameau’s Nephew long before he or his fellow psychoanalysts had. If many critics continued to disdain the writer as too atheistic, too paradoxical, and too unrestrained, Diderot was nonetheless becoming the preferred writer of the 19th-century avant-garde. The full extent of Diderot’s influence was not truly known, however, until a young German-American academic, Herbert Dieckmann, located the final lost cache of Diderot’s writings. Having heard rumors that Diderot’s conservative descendants continued to possess some of the lost manuscripts originally given to the writer’s daughter, the Harvard professor finally obtained permission to visit the family château in Normandy in 1948. After overcoming the postwar suspicions of the caretaker, who was initially put off by his German-accented French, Dieckmann was ultimately directed to some armoires on the château’s second floor. Entering a room that contained several large freestanding closets, he sidled over to the first one and peeled back the door panel. Hoping, perhaps, to find a lost work or two, he was confronted with an enormous stockpile of Diderot’s bound manuscripts. So stunned was Dieckmann that he simply dropped to the floor. Diderot’s final cache, the lost collection of manuscripts he had given to his daughter, had at last been found. What are now known as the Vandeul archives—labeled as such since they came from Diderot’s daughter—have become the most important source for what we know about Diderot and his works. Most astonishing, perhaps, was the discovery of several manuscripts annotated in his hand that revealed that he had been the primary ghostwriter for abbé Raynal’s Histoire philosophique et politique des deux Indes (Philosophical and Political History of the Two Indies), the best-selling critical examination of European colonization. It had been Diderot, as it turned out, who had penned the most influential and best-known anticolonial sections of this multi-volume book, including an imagined exchange between an enslaved African who not only claimed the right to be free, but who predicted a day when Caribbean slaves would justifiably put their masters to the sword. Composed in 1779, a decade before the events in Saint-Domingue (Haiti) would prove him right, this is perhaps the most telling example of the writer’s radical politics, not to mention his ability to see into the future. Some 300 years after he was born, Diderot has now become the most relevant of Enlightenment philosophers. 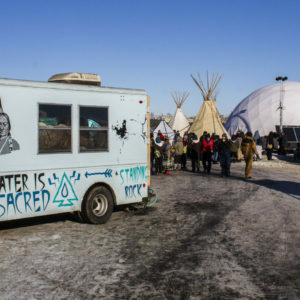 That he refrained from publishing (or taking credit for) his most forward-looking ideas during his lifetime was not simply a matter of avoiding persecution; he intentionally chose to forgo a conversation with his contemporaries in order to have a more fruitful dialogue with later generations—us, in short. His heartfelt hope was that we, the sympathetic and enlightened interlocutors of the future, might finally be capable of sitting in judgment of his hidden writings, writings that not only question the moral, aesthetic, political, and philosophical conventions of the ancient régime, but our own as well. Despite repeated allusions to the importance of posterity, Diderot has not made life easy for his biographers. A more cooperative subject would have left behind a trail of uninterrupted correspondence, the raw material for a tidy account of the author’s acts, words, and interior world. What Diderot handed down to us, especially from his early years, is a comparative wasteland. Of the hundreds of letters that he presumably sent before the age of 30, only 13 remain. This dearth of primary sources is compounded by the philosophe’s relative silence about his youth. In contrast to Jean-Jacques Rousseau, who plunged deeply into his earliest memories in a quest to identify his own inner truth, Diderot studiously refused to look back in any substantive way at the years he spent growing up in his small citadel-like hometown of Langres. The writer is similarly unhelpful regarding his later adolescence and young adulthood, sharing precious little information about his studies at the collège d’Harcourt and the Sorbonne, and never detailing the precise reasons why he, an aspiring ecclesiastic, grew into the most prominent atheist of his era. What we lack in terms of early correspondence is perhaps compensated by the multiple, overlapping descriptions of Diderot provided by his friends and associates. By the 1750s, people began calling him le philosophe (the philosopher as opposed to a philosopher). Some of this had to do with his legendary appetite for learning. The man was a pantophile, according to Voltaire: the type of thinker who falls desperately in love with every subject he studies, be it mathematics, sciences, medicine, philosophy, politics, classical antiquity, drama, literature, musicology, or the fine arts. Friedrich Melchior Grimm, Diderot’s most cherished friend and colleague, marveled at the “force and violent leaps of his imagination.” And the same Jacques-Henri Meister who lamented Diderot’s inability to produce a great stand-alone work of literature, also stood in awe at the way that his friend’s brain worked. Diderot, according to Meister, actually had little influence over his extravagant mind; it was, rather, the philosophe’s own thoughts that led him around without his “being able to either stop or control their movement.” Once he began chasing his own ideas, Diderot was a man possessed, flitting about rapidly and lightly from one extravagant notion to the next, like a goldfinch in a tree. The anecdote most illustrative of Diderot’s intellectual exuberance comes from Catherine the Great. In a now-lost letter that apparently circulated in Paris in the 1770s, the Russian monarch recounted that when Diderot came to the Hermitage, she ordered that a table be put between them during their meetings because the philosophe, who often went into fevered monologues, had gotten in the habit of grabbing her knees and slapping her thighs to make a point. Various stories and anecdotes have left us with a complex, mosaic-like image of the philosophe. But we have also inherited the writer’s own comments about how he might best be remembered. Diderot generated most of these autobiographical insights, as it turns out, when he discussed the portraits, drawings, and marble busts that the century’s artists created in his likeness. That he took the time to speak about his personality, psychology, and even physical size while contemplating these artworks is hardly a surprise: on numerous occasions he affirmed that such portraits absolutely “needed to be well painted in the interest of posterity.” These were the images, he assumed correctly, around which his legacy would crystallize. 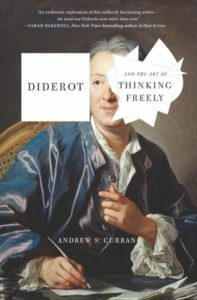 Excerpted from Diderot and the Art of Thinking Freely by Andrew S. Curran, published by Other Press on 15 January 2019. Copyright © Andrew S. Curran. Reprinted by permission of Other Press.